Bobby Blotzer's RATT has recruited former L.A. GUNS and current ANGELS IN VEIN guitarist Stacey Blades and bassist Todd Kerns of SLASH FEATURING MYLES KENNEDY & THE CONSPIRATORS to replace the recently departed Nicholas "Blaze" Baum and Robbie Crane, respectively. Blades and Kerns made their live debut with RATT last night (Thursday, August 11) at at the Buffalo Chip Campground in Sturgis, South Dakota. Video footage of the concert can be seen below. Kerns previously made a guest appearance with RATT on August 6 at Chene Park in Detroit, Michigan. Crane announced his exit from RATT on Wednesday, explaining in a Facebook post that it was "time for [him to] move on and focus on the positive things in [his] life." Blotzer earlier in the month hinted at trouble in the RATT camp, telling ClassX Radio: "We are a great band, that's all I can say. I'm so proud of us, you know. But I also wanna see people having their act together on every level. That includes me, too. Nobody's immune from the… from what we've gotta do out there. "I'm doing all the work behind the scenes, and these cats, all they've gotta do is show up and do their part," he added. "They'd better grow up real quick here, because there's a lot of sailors out there that would give their leg to go out on this ship." Blotzer also defended his decision to go out on tour as RATT without any other original members of the band, explaining that fans just want to hear the music performed the way it was recorded on the group's albums. "No matter what, this band plays so good and does such great integrity to the music of RATT," he told ClassX Radio. "That's why everybody's been hired. The singer just blows Stephen Pearcy out of the water at this day and age. And frankly, [he sounds better than Stephen did] even when we started out." 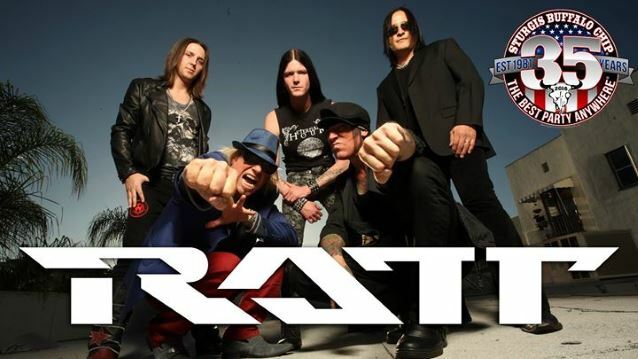 Blotzer's revamped RATT also includes vocalist Josh Alan (ex-SIN CITY SINNERS) and guitarist Doc Ellis (Jizzy Pearl's LOVE/HATE).